The AKD PDMM ™ available from Micromech, combines one AKD servo axis and a master controller that supports up to eight or more additional AKD axes in a single, compact package. It provides integrated control for multiple high-performance axes, complete I/O and HMI interfaces, and includes the full automation capabilities of Kollmorgen Automation Suite™ giving a single, scalable development environment for both AKD PDMM and PAC-based machines. Extending customer design options the AKD PDMM controls as many as eight axes or more without the need for a PLC or PAC thus reducing cabinet space and wiring requirements. It is the perfect machine and motion controller for any project using a single, fully integrated programming environment, in so building a better machine at a lower cost. 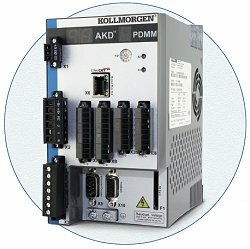 The AKD PDMM™ combines a high-performance AKD™ servo drive with a multi-axis machine and motion control in a single, compact package that can be programmed, tuned and commissioned using the Kollmorgen Automation Suite™. It has one built-in AKD servo drive that serves as a master machine and motion controller for up to 7 or more additional AKD drives. This means a machine can be built to incorporate multiple high-performance axes, complete I/O connectivity and an HMI interface, all without the need for a separate PLC or PAC. Therefore engineers can program a new machine using the same scalable, integrated development environment used for larger PAC-based machines up to 128 axes. As a result the AKD PDMM simplifies the machine, shortens development cycles and gives an agile platform for creating truly differentiated solutions that win new business. The additional major benefit of this product is the reduction in panel space, wiring costs and build time. This means there is accelerated design time and simplified integration and due to the proven architecture of the Kollmorgen Automation Suite there is minimum risk and maximum performance. The Kollmorgen Automation Suite™ simplifies and accelerates development through a unified system of software, hardware, and collaborative engineering. This scalable solution provides a fully integrated development environment for any application, whether programming a single axis of motion, a multi-axis AKD PDMM™ system or a PAC based system up to 128 axes. In the field the Kollmorgen Automation Suite has had outstanding results such as: improving product throughput by up to 25% with industry-leading motion bandwidth; reducing scrap by up to 50% with world-class servo accuracy; seamless power-failure recovery and highly dynamic changeovers; increasing precision for better quality; reduced waste and less downtime using EtherCAT, the field bus with motion bus performance. Furthermore it has enabled more adaptable, sustainable and innovative machines that produce measurably improved marketability and profitability. The Powerlink is an add-on board, compatible with Sigma-5 series command option attachable type amplifiers type SGDV which offers a wide range of functions. Powerlink is an open real-time Ethernet network supported by the Ethernet Powerlink Standardisation Group see: http://www.ethernet-powerlink.org The Powerlink network module offers a wide range of functions based on the EPSG DS 301 and the CiA 402 drive profile standards. Ethernet POWERLINK (EPL) is a communication profile for Real-Time Ethernet (RTE) that extends Ethernet according to the IEEE 802.3 standard with mechanisms to transfer data with predictable timing and precise synchronisation. The communication profile meets timing demands typical for high-performance automation and motion applications. It does not change basic principles of the Fast Ethernet Standard IEEE 802.3 but extends it towards Real-Time Ethernet. The Module supports many functions including profile position mode, homing mode, interpolated position mode, profile velocity mode and profile torque mode. The communication rate is up to 100Mbps; there are two standard RJ45 connectors and 4 LEDs for status indication. It conforms to most required standards: EPSG DS 301 specifications, CiA 402 Drive profile specifications, safety standard UL508, material compliance UL94V-0 and RoHS Directive 2002/95/EC. In addition it meets the WEEE Directive 2002/96/EC, Low Voltage Directive 73/23/EEC and EMC Directive 89/336/EEC. Using low resonance 3-phase stepper motors, smoothness at low speed can be increased significantly compared to a 2- phase stepper motor solution. The unique high resolution, sensorless load detection stallGuard2™ is also used for the world’s first integrated load dependent current control feature called coolStep™.The ability to read out the load and detect an overload makes the TMC389 an optimum choice for drives where a high reliability is desired at a low cost. With 3-phase motors the adapted spread Cycle 3p PWM automatic mixed decay chopper scheme ensures highest smoothness and best zero crossing performance. 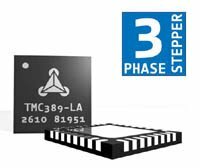 The TMC389 can be driven with step and direction signals as well as by serial SPI™ interface and using the microPlyer x16 allows you to operate the motor with highest μStep smoothness reducing the input frequency divided by 16. A full set of protection and diagnostic features makes this device very rugged. It directly drives external MOSFETs for currents of up to 6A and this way it reaches highest energy efficiency and allows driving of a high motor current without cooling measures even at high environment temperatures. The main features of the module are stallGuard2™ for sensorless load detection, coolStep™ for load dependent current control, save up to 80% energy and gain supreme smoothness. It also achieves the best current zero crossing performance, the best sine wave form and lowest power dissipation. In addition there is full protection and diagnostics, standby and shutdown mode stall / load detection output and low power consumption via low RDS-ON power stage. There is also an evaluation board which comes with the PC software which gives access to every function of the driver. It comes alongside a step and direction interface, a RS232 and a USB port. 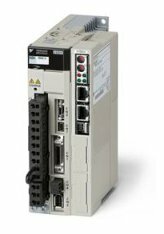 The TMC389-Eval is a complete ‘plug and play’ solution, additionally only a motor, a PC and a power supply are required!